Brand new BMW or an old banger? Decisions decisions. Fans of the Evoque will be excited as the build up to the Paris Motor Show gets fully underway! There is a lot of hype building around the new special edition Range Rover Evoque SW1. The Sw1 draws it’s inspiration from the United Kingdom. It features Union Jacks all over the place! It’s on the roof, the gear stick, the head rests and then some on the wind mirrors as well! So if you voted Yes for Scottish Independence, you might not be too keen. Commenting on its British theme, Land Rover Design Director Gerry McGovern, whose name coincidentally sounds pretty Scottish, said ‘These special editions are a celebration of our Britishness’. It is set to be the first of many Jaguar/Land Rover cars to celebrate Britain and being British. There will be a choice to be made when it comes to the Range Rover Evoque SW1, you will be able to choose between a monochrome version which is the entry level trim as far as we can tell, or what they are calling a full colour variant which is the more premium package. The premium package will give you the choice between lots of different colours which range from ‘Loire Blue to Firenze Red’… Blue and red then. You are also able to modify the alloys and have them in Fuji white, whatever that means. 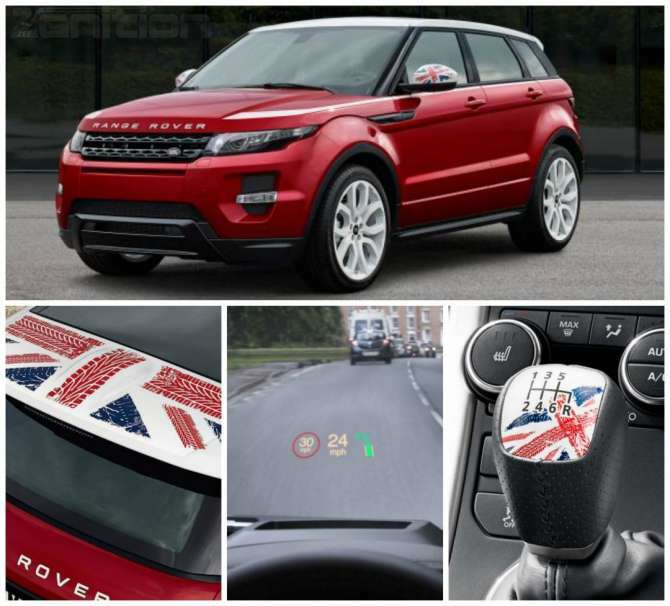 Another point of interest with this special edition Evoque is that it features the world’s first laser HUD. The laser projects all your essential information on the window in a crisp and clear way only achievable by lasers! Whilst this is exciting it is nothing on the Transparent Hood technology that Land Rover revealed back in April which we expect to see in the future on the Land Rover Defender. Copyright © 2019 Used Cars Near Me.